Each San Diego Comic Con, the number of exclusives grows and grows. It seems like every company, large and small, has at least one if not multiple figures/busts/comics/etc. etc. etc. that are available only at the con. Just like every year, I brought back more of them than I expected. Oh sure, I make my little list before I go, fully planning to stick to just the 'necessities', but I still shipped back three boxes of stuff. After getting them all home and checking them out more closely, one stood out from all the others - Mezco's 'Gomez' figure. Who is Gomez? 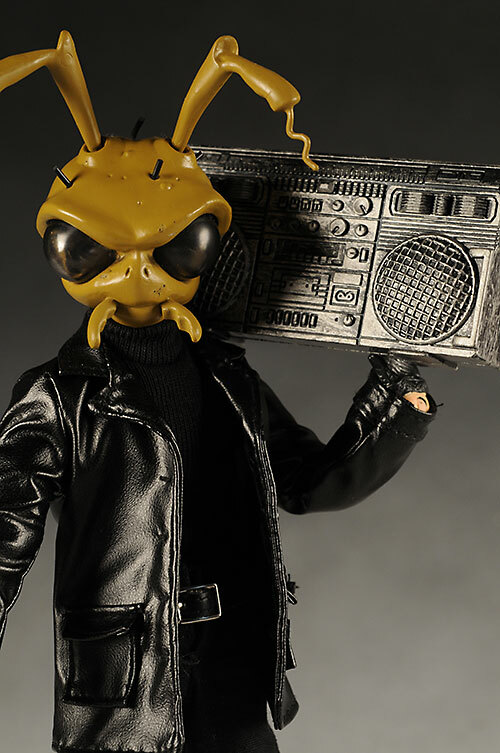 He's the long time mascot for Mezco, a roach of mystery. Actually, he looks a lot more like an ant than a roach to me, but I'm no entomologist. 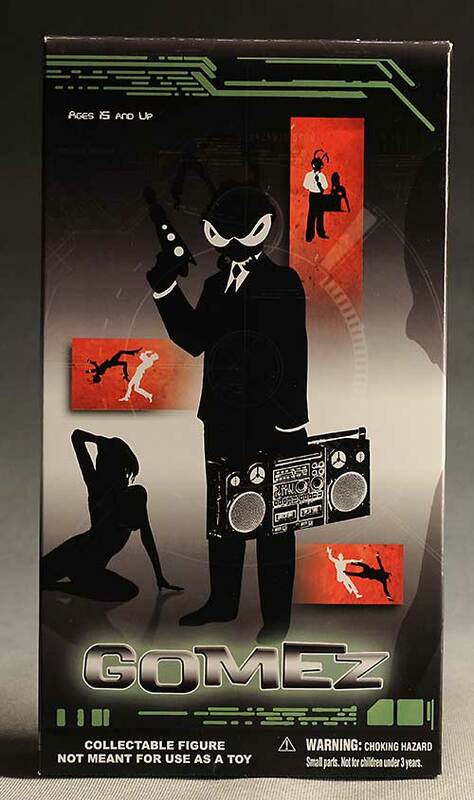 The Mezco site says "Mezco’s infamous mascot is also the secret agent of an organization known only as “The Void”. This man (or roach) of mystery is up for any mission. Armed with his specialized arsenal, Gomez is ready to take on any task." 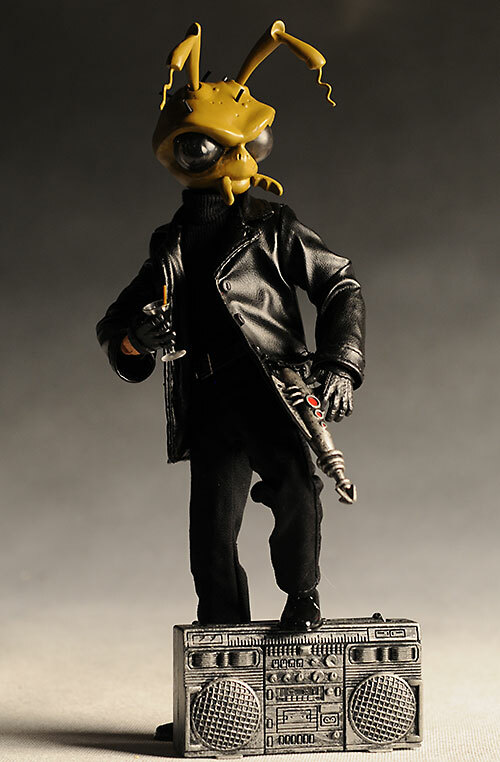 This insect of international espionage and mystery is a limited edition of just 500 figures, and actually came in multiple versions. There's a black suit version and a version with the black leather jacket and turtle neck. These figures also came in a couple different head colors - tan and black. The black head color was the more rare of the two. 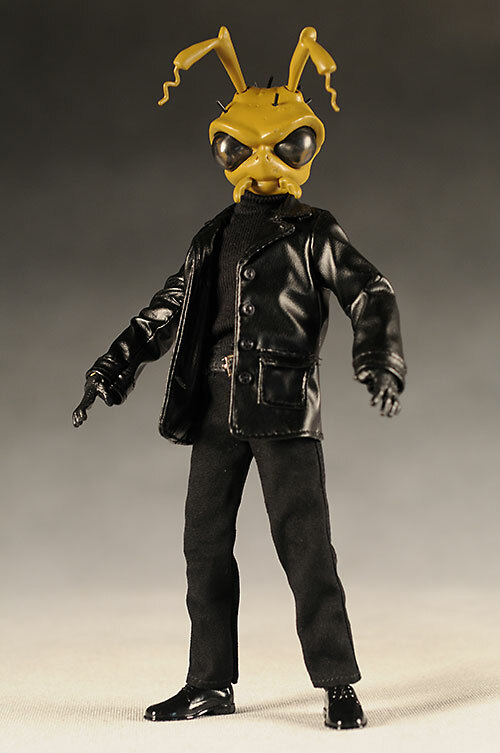 I'm reviewing the tan head/black jacket version, the one I actually wanted. 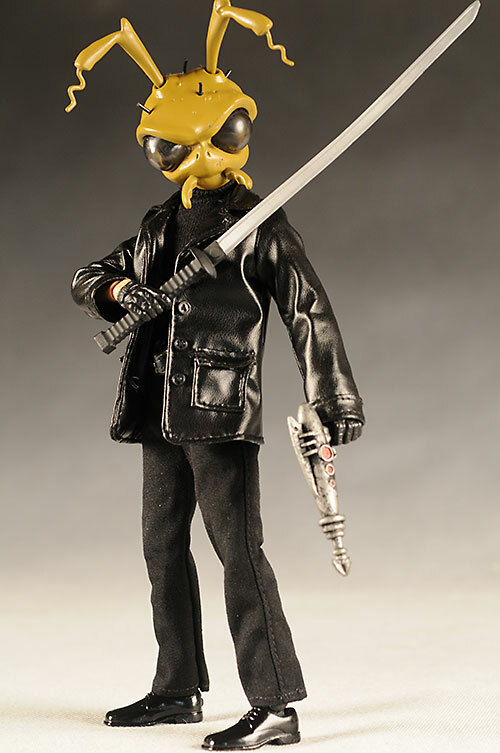 While the suit is good, I prefer the ultimate cool of the jacket/turtleneck combo, and the black head makes the figure too consistent in color. Your mileage will vary of course, and while the figure cost $40 at the show, you may end up doing the ebay-bop to get this thing now. The boxes do a reasonably good job showing off the figure, especially since they could have simply gone with a white container like most SDCC exclusives do. Inside, the figure and accessories are laid out in a plastic tray, and the whole thing is completely collector friendly. No need to damage a thing to get him out, and you can put him back for storage as well. The variants are 'blind boxed'. In other words, there's no way to know which one you've gotten until you open it up. I'm not a big fan of blind boxing, but with something like this, I only wanted one anyway. If James Bond tried to teleport, but a roach ended up in the booth somehow, you'd get Gomez. 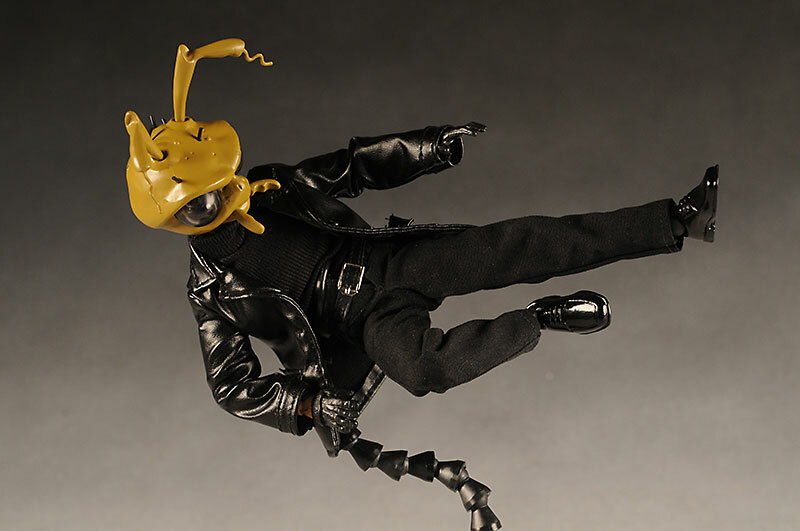 With the body of a person and the head of an insect, he's quite the unique character. Well, except for the Fly, of course. The name Gomez makes sense, right? Go-mez, get it? Yea, thankfully the figure isn't nearly as lame. As you'd expect with such a creature, the insect head is large and over sized, yet still seems 'correct'. I'm not sure what that means, but perhaps it's because the old Fly movie set our expectations for how such a monster might look. The head sculpt isn't super detailed, with only a little bit of texturing on the skin, mostly around the nose and eyes. Still, it's one of the coolest designs I've seen in quite awhile, and shows you can do things that aren't straight licensed product with success. Sure, they won't sell a million of them, but the 500 sold out in no time, even at the higher price tag. One of the coolest features is the eyes. They are made from a smoky translucent plastic, and reflections dance deep within, making the insect-look complete. The standard hands are posed in gestures, while the extra hands are fists and gripping style. These all look good, hold the accessories well, and work with multiple poses. They are all sculpted wearing black leather gloves. And in case you didn't know, this is a 9" scale figure, or 1/8th scale. We'll see more of this body from Mezco in the coming months. There's not a ton of paint here, but what's here is done well. The smoky eyes I mentioned earlier are great, and there's a bit of a black wash used to highlight the skin details. I would have liked a bit more paint work around the mouth and antennae to make them pop a bit more, but it's a minor complaint. One of the best features of this figure is the underlying 9" body from Mezco. This is a figure we'll see in several other lines from them later this year and next, including the Warriors and Heroes. And after playing around with it on Gomez, I have to say I'm extremely happy. The neck is ball jointed, with an excellent range of movement. Of course, the turtleneck helps, since it hides the long neck quite well. I'll be interested in seeing if the neck articulation works as well with normal folk like Sylar. He has ball jointed shoulder and hips, with joints on both sides of the ball, double pin elbows and knees (I believe), and pin/post wrists. The ankles are also pin joints, with a rocker joint at the foot to allow inward and outward movement. The shoulders move inward toward the chest, allowing the hands to come close together, and also allowing the arms to fold across the chest tighter than usual. I didn't strip him down to figure out just how they worked, but I have to say they did the job quite well. There's also both the ab crunch and waist joints, and these work terrific. Overall, the body was able to take some very natural poses with very minimal effort. It's well designed, and I'll be happy to pick up other Mezco figures in this scale, comfortable with the underlying articulation. Completely unrelated to the basic body, he also has two more joints - his antennae! Yep, you can turn them, and even tilt them slightly from side to side. There's a small ball joint where they are inserted into the skull that allows this movement. Gomez comes with quite a few extras, all of which fit nicely with his man about town lifestyle. 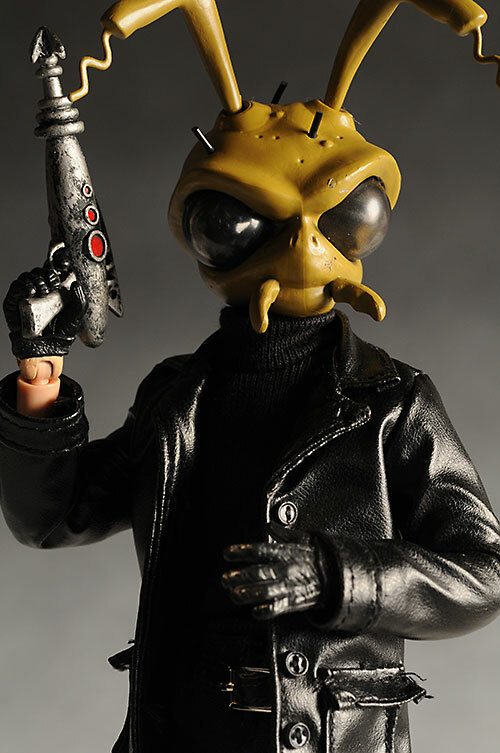 Any good international spy requires a gun, and Gomez has a retro space blaster, called the Atomic Pea Shooter. It fits in his gripping hands well, and has a great 50's feel to it. The paint is done in a weathered style, which works well with this accessory. He also has a boom box, and the silver weathering doesn't really work for me here. The sculpt is great, and the handle can flip up or down out of the way. But the silver/black paint job doesn't look quite as good here as it does on the ray gun. Gomez has a huge sword for those silent kills, and this thing is almost longer than he is tall. They call this a 'zip' sword, made of the rare Magmezium...which looks a lot like plastic. He can hold it in one or two hands, and the sword is fairly stiff and solid. No floppy sword for Gomez. His other major accessory is his martini. Every suave insect with a license to kill loves a martini. He can also hold it in his gripping hands, and looks quite casual with a drink in his hand. Speaking of hands, there are two extra sets to go along with the standard gesturing hands. One set is fists, while the other is gripping style. The hands pop on and off quite easily, but don't fall off all on their own or with basic posing. Finally, there's a display stand. This is one of the versions with many segmented sections that allow for all kinds of bizarre poses. This stand is actually for a 12" figure, so the waist hook sits far further up than appropriate with the stand arm is out straight. But that's okay, since the segments allow you to bend it down into just about any shape. I don't use stands, but if you want some more wild poses, this one will give you that option. My favorite feature of this figure is the outfit. 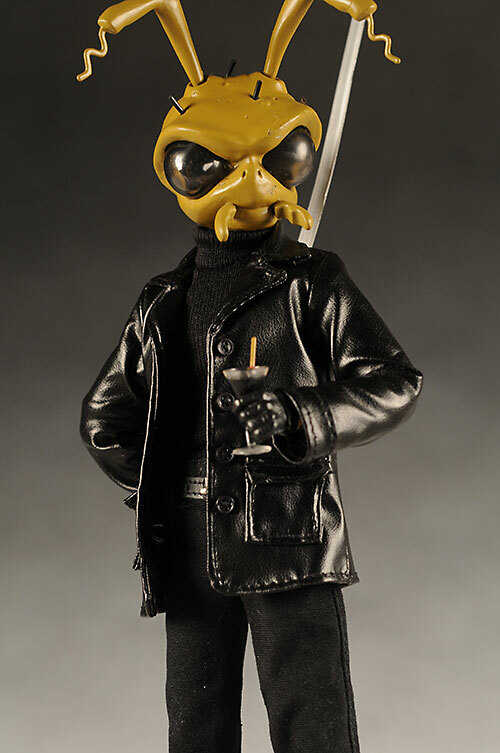 It's hard enough to get pleather to look right in sixth scale, and yet Mezco has managed to make a PERFECTLY tailored leather jacket in this smaller size. The buttons are a little big on the front, but the thickness of the pleather is just right, allowing it to hang very naturally on his body. The length of the jacket and sleeves, the size of the lapels and collar, even the pockets look just about right. Under the jacket is a turtleneck shirt, also nicely tailored and made from high quality thin material. The pants fit nicely, even with the thin legs, and the belt has a real metal working buckle. The shoes are actually his sculpted feet, but that's fine for a figure in this scale. The black suit version I saw at SDCC looked equally as good, so you should be happy no matter which version you end up with. I posed and reposed this guy for quite awhile, and found him to be pretty sturdy and play friendly. 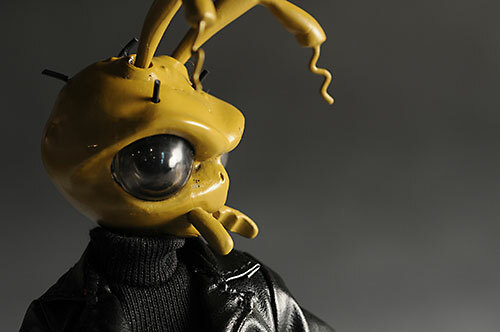 I'm not sure too many kids would find a roach in a turtleneck the kind of thing they'd add to the toy box, but my seven year old son, upon seeing him, uttered the critical word..."Awesome!" Now, let's not go thinking this guy was inexpensive. At $40, he's not a 'cheap' SDCC exclusive. But there are a couple things to take into consideration. First, it was a very low production run at just 500 figures. Second, they gave him quite a few unique accessories, as well as an excellent outfit. And third, most 12" figures are getting into the $60 - $80 range these days, leaving behind the $40 sixth scale range far behind. While I'm hoping we'll see the regular run figures that Mezco produces on these new 9" bodies more in the $25 - $30 range, I have to admit that he's not a terrible SDCC value. Not great, but considering that he's one of the cooler exclusives I brought home, I'm not too upset. His little Brundle-hairs can be broken off if you're not careful - trust me. Nothing a little super glue couldn't fix, but you'd probably prefer not having to do that in the first place. Some of the joints were a bit tight to start, particularly the ankles, so take some care freeing them up. Once they are loose, you should have no trouble. I brought at least two dozen different exclusives back from SDCC, and none of them have the overall cool of Gomez. He reminds me of a cross between sixth scale action figure and designer vinyl, an 'artsy' figure with a retro design that's plenty of fun too. I'm also glad that the body turned out as well as it did, since Mezco will be using it for a number of other figures. The other critical aspect here is the outfit. Mezco has done some great work in this scale (and even smaller) with clothing in the past, something a lot of other companies seem to have issues with. I don't ever want to hear that you can't do a good looking sixth scale leather jacket again. Originally, you could pick them up as pre-orders from Mezco's Store. They might pop up there again now that the show is over, but if not, you're next best bet is to search ebay for a deal. Hmmm - no other really related links, but you can check out my complete SDCC 2008 coverage. 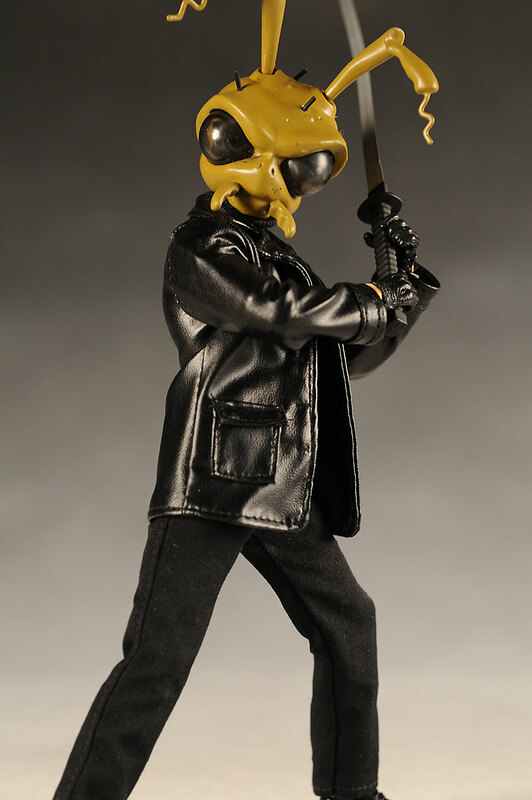 You can also head to Mezco's forums to discuss Gomez and all other things Mezco.